The multifaceted work of composer Seth Cluett has garnered wide praise for, among other things, its attention to detail and organic sense of order. Cluett often explores sound in its ability to create or construct a listener’s sense of place, memory and time, using such sonic detail to wring the specific and personal out of the abstract. At the same time, on wound of this deep blue., Cluett limits his own control over this process: he mixes seven tapes recorded on a cassette dictaphone from live performances between 2005 and 2013, but without adding any other processing or edits. Within this framework, the resulting two pieces unfold subtly, inviting the listener to engage deeply to penetrate them. However, far from inviting a guessing game of identifying sound sources, Cluett’s compositions pull back veils of sonic richness that are both concretely and abstractly engaging. For larger artwork, click here. Sound samples for both can be heard here. 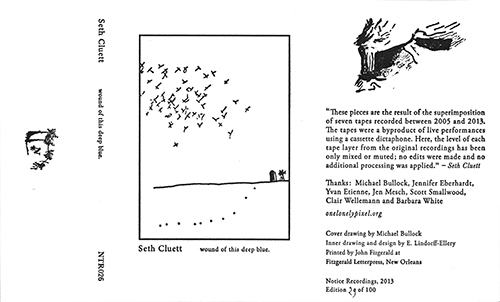 A wonderful cassette recording from Cluett, fashioned from seven Dictaphone tapes of earlier performances of his (2005-2013) without otherwise being processed or edited. If there’s more to it than that, I’ve no idea, but the effect is marvelous. You get a sense of several discreet entities, each with their own “goal”, inhabiting, for a few moments, the same space, gliding past one another. I imagine glass panels, encrusted or imbued with various substances, arrayed adjacently, the light passing through forming connections, transmitting colors and shadows, but otherwise separate. There’s a very organic progression here, impossible to tack down but feeling entirely natural and even, paradoxically, space-specific. The flow is fantastic, always convincing, forever encountering strange and fascinating vistas, letting them go, glimpsing new ones on the way in. The elements themselves vary widely from throbs to scratches to howling air and far more, yet they manage to embed themselves into the same, gnarly, bumpy fabric. Really fine, an early favorite of 2014. … His music was released on Line before (see Vital Weekly 774), which might give an indication of where to place him in the musical spectrum. On this cassette he presents seven recordings from seven concerts, all recorded on a dictaphone, and he mixes them together. He calls this ‘superimposing’, which means a pretty much straight forward layering of those seven tapes, without any further processing or editing. There are no instruments mentioned here, but it might very well feedback, hum, and/or some instrument, like a wind instrument or such like. The odd thing is of course that I never had the idea of listening to seven recordings at the same time, but rather to one, highly minimal piece of music. It made me wonder what a single recording would sound like. This is a fascinating piece of music. It’s very subtle, yet very rich in sound. Mysterious and somewhat dark, but a true delight to hear. Dark matter audio. This is some quiet, sparse, subliminal sound artistry. Multiple media artist / performer / writer / professor Seth Cluett makes a low fidelity abstract music that hovers near some of Hands To’s earthy manipulated textures. This project was apparently the product of a number of separate recording sessions (done between 2005 and 2013) which were then superimposed without any editing but for volume levels or muting. So what he’s done here is he has made seven (stipulated in the liner notes) tapes of material, some of them from live performances, and played them at the same time. Sounds are fortuitously blended to map out otherworldly spaces. The low fidelity of the source material and the effect of its resulting combined state brings the otherworldliness of our organic reality to the foreground. The resulting catalog of raw textures brings attention to other levels of existence, such as say, the consciousness -if such a thing would have a consciousness- possessed by an ancient sea rock, or a giant Sequoia tree. Somehow there are other worlds vastly different than our own, and somehow they are unimaginably close to us, rather than light years away. Varieties of subtle meandering drones loosely undulate as indescribable shadow-laden events take place in the periphery. Cluett sometimes seems to use musical instruments such as guitars and synthesizers, but mostly it sounds like he uses field recorded sounds. Slow scraping sounds, hums, feedbacks, moments of machinery usage, sounds of air moving, fizzing, electrical sounds, moments of nature, and other “real” sounds are found by microphone and held by tape. The musical instruments are blurred and obscured until recognizable only as a tone or combination of tones. Cluett’s sound gathering and creation sensibilities are in tune with the rhythms and forces of the natural world. Wound of this deep blue is a gently challenging meditative audio taxidermy of everyday beauties. Glad to have had this artist brought to my attention as he is one to watch.